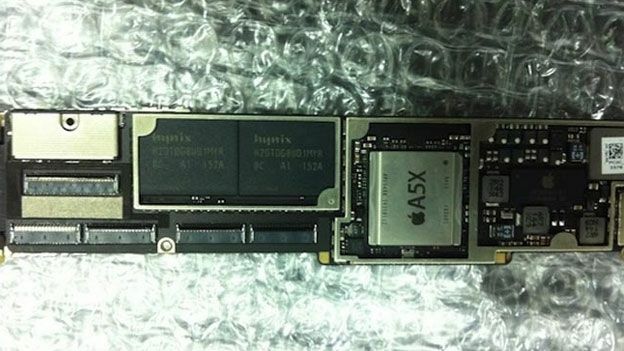 Apple iPad 3 to feature A5X dual-core ARM processor? With a little over two weeks remaining until the expected unveiling of the Apple iPad 3, new reports have suggested the tablet will touch down with an A5X processor. With the existing iPad 2 device rocking a dual-core A5 chip it was widely expected that Apple's next-generation tablet would follow the latest hardware trends and make the jump to an A6 quad-core offering for the iPad 3 release announcement early next month. New reports have seemingly quashed these expectations, however, with new images of what is being touted as the iPad 3 innards showing an improved A5X CPU that would likely improve on the current 1GHz dual-core offering whilst falling beneath the quad-core option. Whilst reports of a second, 8-inch tablet landing alongside the iPad 3 next month have been largely discredited, a number of reports have suggested the third-generation tablet will be officially unveiled on March 7th ahead of a formal in-store release later the same month. Tipped for inclusion on the second-generation Apple tablet, the iPad 3 is expected to play host to a higher resolution screen, similar to the Retina display offering found on the iPhone 4 and iPhone 4S. "The new display is capable of greater resolution than the current iPad, with more pixels on its screen than some high- definition televisions," an unnamed insider source announced recently. "The pixels are small enough to make the images look like printed material. Videos begin playing almost instantly because of the additional graphics processing." Elsewhere recent iPad 3 rumours have suggested the iPad 2 replacement will feature a form factor 1mm thicker than its predecessor with the increased internal space to be filled with the new display and improved optics for the rear-mounted camera. Would you like to see Apple launch a smaller 8-inch tablet alongside its current 9.7-inch market dominating model? Let us know via the T3 Twitter and Facebook feeds.